The following is a list of materials we commonly use for installing experiments in the rocky intertidal. All of these can be purchased fromMcMaster-Carr. At the McMaster website you can enter the part numbers in bold below to take you to the corresponding catalog page, where you can find other choices on sizes and quantities, along with pricing. The wonderful and ubiquitousblue anchors you find left behind in the rocks everywhere. These require a hole 5/16" in diameter to install into the rock. Use the 5/16" drill bits listed below. These have no internal threads when first installed, so the first time you screw a bolt into them it will be a little stiff. 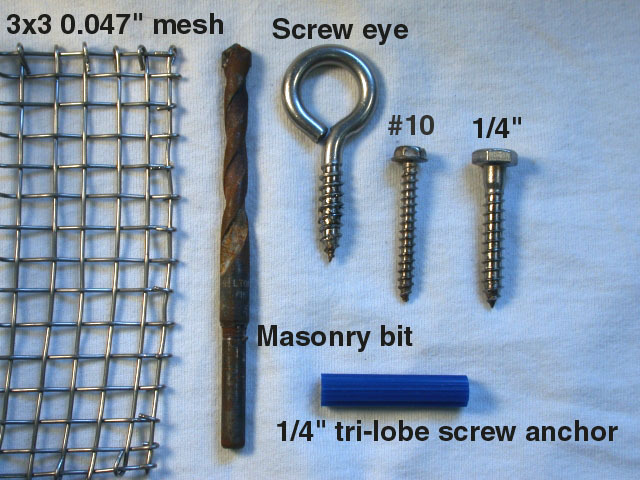 The screw eye, installs into blue anchors, very useful along with zip-ties for securing cages, mesh, and wires. These have a hex bolt head on them and require a 7/16" socket to turn. They screw into the blue anchors. Use these to bolt down settlement plates, cages, and whatever else you want. Drill a 1/4" or 17/64" hole through your object to put these through. These also get used in the blue anchors, and are sometimes useful for bolting down smaller things. They use a 5/16" hex head socket or nut driver, or else a flat bladed screwdriver. Use this to drill holes for blue anchors using your SDS-chuck-equipped Ryobi hammer drill or electric hammer drill. Use this to drill holes for blue anchors using your standard-drill-chuck equipped Ryobi hammer drill or electric hammer drill. Use this to drill holes for blue anchors if you don't own a gas or electric hammer drill. Bring along a hammer and prepare to suffer. Zip-ties, Cable-ties, whatever you want to call them. Secure plastic mesh to stuff, hold down cables, and do whatever else you want. 50-lb tensile strength is usually sufficient for withstanding waves if you use enough cable ties for the load. Use this or a similar size for making cages and fences that will last for years. The mesh is not cheap, but gets cheaper if you buy in bulk. When mounting in the field, you can make holes through the mesh by simply drilling through it with your masonry bits and continuing into the rock below. Use these large fender washers with the 1/4" lag bolts to hold down cages or tuffies or whatever else needs some support. Use Polycarbonate (aka Lexan) cut into 3"x1" strips, with a 1/4" hole drilled through the middle, to hold down cages. This can be used in place of the washers above, and obviously you can cut these to whatever size you like. The polycarbonate is much less likely to crack in half from overtightening compared to acrylic. Clear Cast Acrylic Sheet .25"Thick, 12" X 12"
Use Acrylic for making settlement plates in the standard 10x10cm size or whatever you like. Acrylic is cheaper than polycarbonate, so for uses like settlement plates where you need a lot of material, and ultimate strength is less of a concern, acrylic is a better choice. This is a useful wrench for installing the 1/4" lag bolts. If you have to put a lot of bolts in and out, this will do the job faster than a normal ratchet or hand wrench. Slap a 7/16" socket on the end. Here's another helpful hint: if you're only ever going to use this for installing bolts, have someone weld the socket onto the end of the wrench, so that you can't ever lose the socket. You can copy and paste the contents of your McMaster cart into a word document to turn in to the purchasing office. The best method to strip out some of the HTML is to click the Print option on the McMaster order page. It will generate a new window with your order formatted for printing. Just cancel the print job and use the text in the new window to copy and paste into Word. Highlighting the order and copying it over to Word should produce a nicely formatted table.